History Isuzu company largely coincides with the history of the development of diesel engines in Japan. It diesels can be called "card» Isuzu. In 1916, the two companies - Tokyo Ishikawajima Shipbuilding and Engineering Co., Ltd. and Tokyo Gas and Electric Industrial Co. We decided - to begin production of cars. Until that time, since the development of the world's first diesel engine (which happened thanks to the German engineer Rudolf Diesel in 1893), no one in Japan has not found ways of its practical application in the automotive industry. While many private companies have made attempts in this direction. In 1918, Tokyo Ishikawajima Ship Building and Engineering signed an agreement with the British company Wolseley Motors and in 1922 began to gather at the factory trucks under license. The first released model called A-9. After the merger in 1933 Ishikawajima Automotive Works company with Dot Automobile Manufacturing Inc. Alliance was named to Automobile Industries Co., Ltd., and released in the same year for the trade and industry ministry is called the truck Isuzu - allegedly after one of Japan's rivers. The following year, 1934, Automobile Industries Co. He founded the Committee for Research on diesel engines - it was part of the labor policy of the then president of the company Tomonosuke Cano (Tomonosuke Kano). And two years later, in 1936, he was born in Japan, the first diesel engine with air-cooled - DA6. This was a major breakthrough in the development of diesel engines in Japan. And in 1937, Automobile Industries merged with two other companies and changed its name to Tokyo Automobile Industries Co., Ltd. In 1941, Tokyo Automobile Industries is the only company to receive permission from the Japanese government on the issue of diesel vehicles. In May 1942, the company stood out Hino Works - into a separate company, called Hino Heavy Industries. At the end of the war, in October 1945, it resumed production of gasoline and diesel truck TX40 TU60 truck. TX61 Trucks were widely used in post-war Japan during its recovery from the ruins. Its current name - Isuzu Motors Limited - the company received in 1949. In 1950, in response to the growing post-war demand for the production of cars in Isuzu developed the DA80 - Japan's first V8 diesel engine with water cooling, as well as set up the combustion chamber with direct injection with an improved design, which has sparked interest in the automotive industry due to their improved performance . And in 1953, signed an agreement on technical assistance to the British company Rootes, Isuzu launched its first passenger car, is a copy of the British Hillman. In 1959 he went 2-ton truck Elf, which began very successfully sold through DA640 economical diesel engine and excellent permeability in combination with a load capacity and durability. 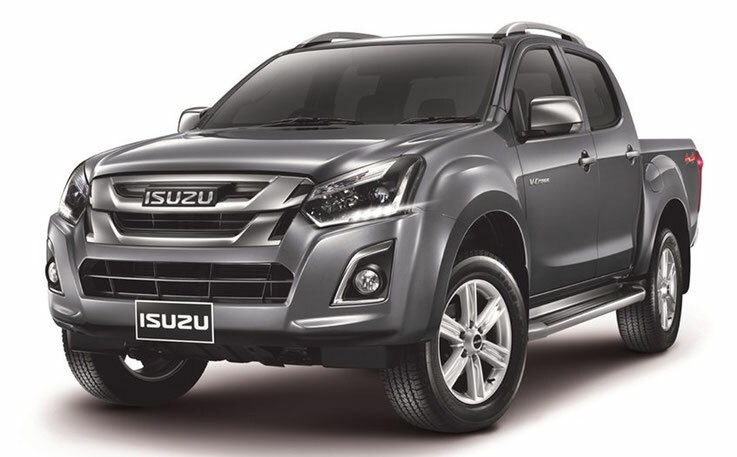 In fact, it came to diesel engines, Isuzu has been a pioneer in many respects. DL201 capacity 1991 cc - For example, the first diesel engine for passenger cars it was released in 1961 For him, Isuzu has received an award from the Japan Society of Mechanical Engineers. 1962 - opens Fujisawa plant and car Bellett was introduced the following year. presented car Florian and Japan's first 4-stroke diesel engine with direct injection for trucks - in 1966 a branch in Thailand was founded in 1967. 1968 - the appearance of passenger model 117 Coupe. In 1971, Isuzu has entered into an agreement with General Motors, the Americans sold 35% of its shares. 1974 - Year Results Collaboration Isuzu and General Motors - Gemini passenger car. And in 1975, it was based Isuzu Motors America - Department of the United States. 1977 - Issue Florian models with economical diesel engine, and 1979 - the year of manufacture of diesel Gemini. In the same year he completed the construction of the test site Hokkaido. 1980 - beginning of production of Fargo series vans. 1981 - the appearance of the model Piazza (3-door coupe). In the same year, Isuzu has developed the world's first system for quick start diesel engines, which allows to avoid long warm-plugs. The system, which includes ceramic candles with high heat resistance and an electronic control, has become a mandatory component of diesel engines, especially in passenger cars. On trucks Isuzu was the first to apply the regulation of electronic diesel engines. 1983 - start a family in the sale of cars Aska (Florian). Aska in the same year won the first place in the British Rally RAC. The following year, 1984, in the Japanese market Aska model was released, equipped with the NAVI-5 - 5-speed transmission with electronic control. But the US market began selling a new version of the Gemini model (in the US it was known as the Geo Spectrum). 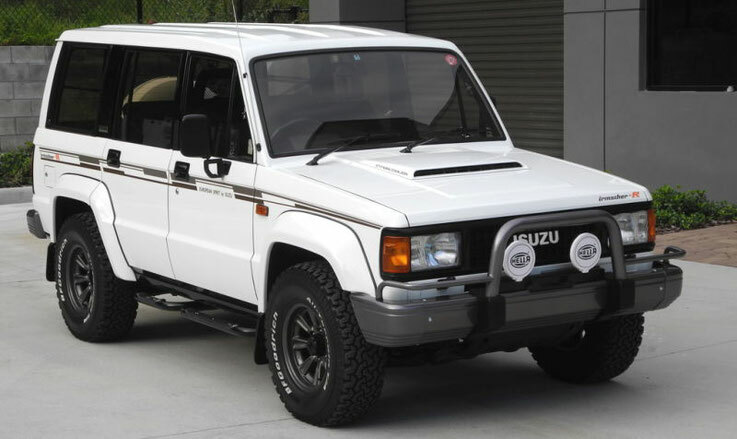 His first Isuzu SUV made in 1985 - it was Rodeo Bighorn, which exports have picked another name - Trooper. He was issued with a turbo diesel engine and a gasoline. Ended decade show in 1989 a new type of SUV - MU (Amigo). By this time, the production of medium and heavy trucks Isuzu was the first in the world, has opened an office in Australia (Isuzu-General Motors Australia) and a joint project with Subaru - Subaru-Isuzu Automotive Inc. (SIA). At the SIA plant in the United States in 1990 began the production of Rodeo model. In 1992, there was an environmental charter Isuzu, and in 1993 the company Vauxhall began to produce its own version of Trooper - model called Monterey. MU won the Paris-Dakar in the class diesel prototypes. 1994 - Paris-Dakar wins Trooper in marathon and a mixed class; in the US market starts selling Honda Passport (version Rodeo). 1996 - Another rally victory - Trooper (Holden Jackaroo) leads the Australian Safari. In 1997, a new model - VehiCross, an SUV based on the Trooper, with an engine of 3.2 liters capacity of 215 hp A year later began mass production of the truck Elf CNG, compressed natural gas, and a year later, in 1999, VehiCross will debut in the US market. At the same time General Motors increased its stake in Isuzu to 49% and the beginning of the work of office in Poland - Isuzu Motors Polska. In 2000, the United States began production of diesel engines by DMAX, Ltd., and the company is General Motors Isuzu Commercial Truck, LLC was founded. 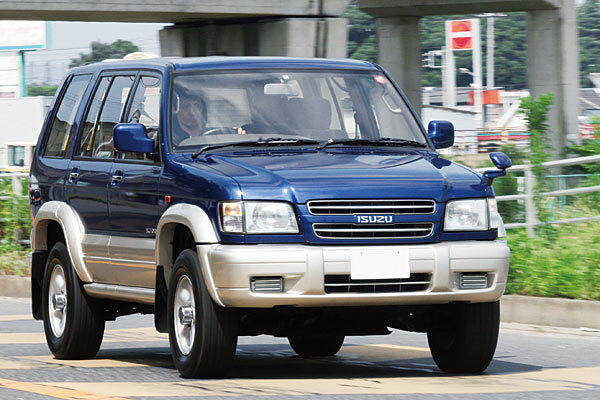 In May 2001, it was announced the new interim business plan Isuzu - V-Plan. Diesel Duramax 6600 was selected as one of the 10 best engines in the opinion of the professional magazine Ward's Communications (the same happened in the next, 2002). Instead of V-Plan new three-year business plan was adopted; Elf became Japan's first truck in its class, the new accounting standards and the requirements on the content of harmful substances in the exhaust. Currently Isuzu according to increase the market demand, successfully developed diesel engines with improved environmental parameters. In accordance with the agreement reached between Isuzu and General Motors, Isuzu is actively working on diesel engines, GM group performing in the role of an expert in this field.